Updating has become really hard for me, so lately I've just been updating quick status updates on Facebook!! I will admit its the easy way out. So, I apologize. 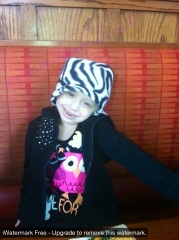 Emily is doing amazing, the best we have seen her since she was diagnosed 2 years ago. While that thought of things happening and spreading in her little body that we can't see, it really is a huge fear for us, we have a lot of HOPE that all that is fear is just fear. We are hopeful that the regimen she is on is working. We see the happy, silly, creative and fun 5 year old and that is amazing in itself. Emily is 31.5 pounds and she hasn't been over her diagnosis weight of 30 pounds 2 years ago. Emily started the 2nd round of this regimen she is on last week and the chemo started Saturday, so today is day 3 of the chemo. She really has been doing very well with the chemo, and we really haven't had any major side effects. We continue to do the homeopathic stuff at home to help her with her day to day, her blood counts and just feeling good. They seem to be working because her counts haven't tanked and the one we were most worried about, platelets never dropped below 20! So amazing. We have a lot happening in the next few weeks. Someone we have never met but lives in our area won tickets to the "Yo Gabba Gabba" show and she gave them to our family for Emily. Emily will be so excited and we thank you so much Laura. Next weekend Emily and daddy have a date night and then Saturday an amazing man, who owns Wholesale Guitars and has a huge heart for others and other helpers are putting on a fundraiser for our family where there will be a raffle, giveaways, Hali Hicks and other talents there! We hope to see many of you locals there and please introduce yourselves if we haven't met you. And last, scans have been scheduled for the last week of February. We are waiting to hear back from Wings of Mercy if they have volunteers for the 26th for flight out and the 28th for a flight back in. The Renucci House has been scheduled and we need to work out car rental as soon as we know if we have a flight. Scanxiety is getting close again and getting into high gear. So with scans coming up, she has her fused MIBG/CT scan on Wednesday the 27th and we meet with Dr Sholler to go over the scans on the 28th. We ask that if you have any "Emily Gear" that you wear it on either of those days. Make sure you share your pictures of Emily Support on Emily's Facebook page (http://www.facebook.com/emilysjourney)... If you need any Emily gear, we still have plenty of Emily Bracelets for $3.00, just email me and let me know If you are interested in one. Thank you again for all of the love and support from all over the world and all of the amazing people out there. Make sure you hug and kiss your kids and tell them you love them!! Standing beside you all in prayer and seeking 100% healing hear on earth.